So, you know how everyone has a layered Mexican dip they like to serve and bring to parties? I like them as much as the next gal but sometimes I want to jump a little outside the box so I decided to to try the same concept with Greek ingredients. 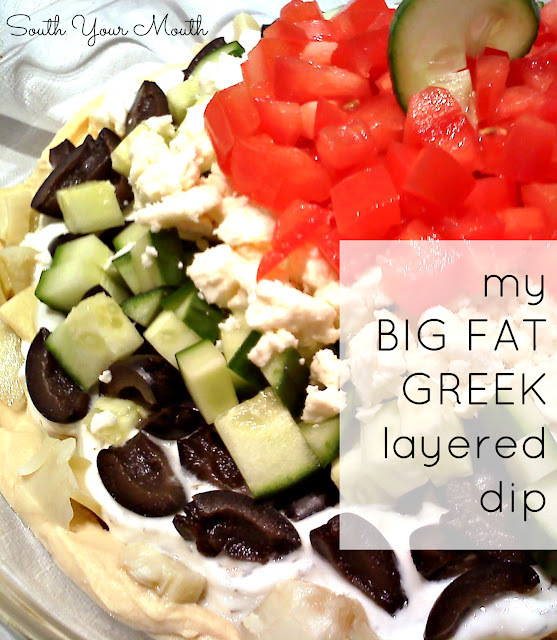 What's so awesome about the Mexican layered dips are the contrasts in texture and flavor and this Greek version mirrors so many of them... the hummus replaces the smooth body of the beans, the tzatziki replaces the creaminess of the sour cream, the feta replaces the tang of the salsa, and the fresh vegetables still get to do their thing. You can totally add or omit whichever Greek-inspired ingredients you like. Using a small trifle dish or large glass pie plate, layer all ingredients in order listed (starting with hummus on the bottom and ending with tomatoes on the top). Drain the artichokes and olives as much as you can as they hold on to a lot of liquid which may weep out into the dip the longer it's stored before serving. Refrigerate until ready to serve. Serve with pita crisps or fresh pita cut into wedges. Combine all ingredients and mix well. Refrigerate until ready to serve. I want to make this, but I need to know about the artichokes...are they the plain ones in a can or the ones in a jar with oils & spices? This sounds fabulous as do most of your recipes. I used plain but you can use whichever you like! Are you struggling to lose weight? Do you wish there was a secret to fat loss? By now you've probably been surfing the internet looking for answer to your weight loss question for at least an hour and you are ready to read something of real value...am I right?